Norma is 90-years-old this year — but she leads a fuller, far more adventurous life than most of us can imagine. She has gone through her fair share of tragedy and loss. Just last year, her husband of 67 years passed away. Days after, doctors detected a deadly, cancerous mass in her uterus, and started preparing her for the worst. Instead of lining up for cancer treatment, which would have involved undergoing major surgery, followed by rounds of radiation and chemotherapy, Norma decided to leave. She left the hospital and bid farewell to everyone at her nursing home. With her family in tow, Norma hit the road in an RV camper. They’ve been traveling for the past six months, visiting several stunning national parks and traversing miles of breathtaking, rugged terrain across the country. 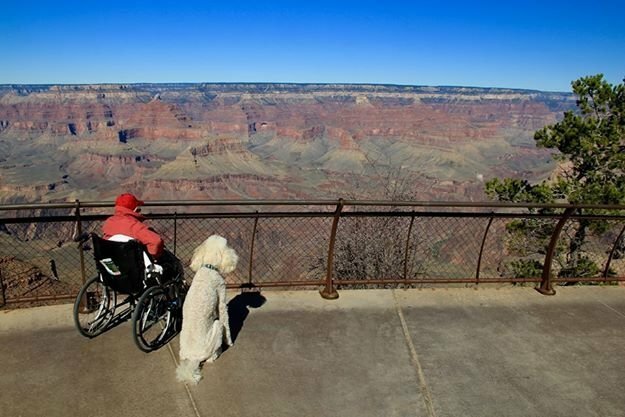 Scroll on to read Norma’s heartwarming story, and to see photos from her amazing travels. Let us know your thoughts in the comments below! Norma, a 90-year-old Michigan resident, didn’t have the greatest year in 2015. In a single week, she lost Leo, her husband of 67 years, and was informed by doctors that she had a large cancerous mass in her uterus. Doctors first detected some blood in Norma’s urine during a routine exam, and asked her to come in for an ultrasound. That’s when they discovered the tumor. Doctors immediately began listing her treatment options. There was going to be surgery, of course, followed by rounds of radiation and chemotherapy. The doctor asked Norma how she wanted to proceed with her options. Norma paused for a minute, feeling exhausted. She had talked to her son, her daughter-in-law, and the rest of her family about her decision. The doctors couldn’t stand in her way — in fact, they wouldn’t stand in her way! “As doctors, we see what cancer treatment looks like everyday,” one of Norma’s doctors toldGoodNewsNetwork. So he wished her all the best, and told her to enjoy herself on her trip. At first, Norma’s family couldn’t bear the thought of her leaving to travel, let alone leaving the nursing home. So they decided to go with her and take her to all the destinations she had never visited before. For the past six months, Norma and her family have been traveling around the United Sates in a mobile RV home. They have even traveled to countries outside the States, including China! Fortunately, Norma has experienced no pain so far, and even feels like her cancer might actually be going into remission. So far, Norma and her crew have visited several national parks, the Rocky Mountains, New Orleans, and have even joined in the festivities during a Native American ceremony. Norma even took in breathtaking scenery from her seat on a hot air balloon ride over central Florida! Although she has experienced her fair share of tragedy and loss, Norma maintains a strikingly positive attitude every day in her life. “Keep praying every day, and God will take care of you, even when it feels like you can’t care of yourself,” she told GoodNewsNetwork. Reminiscing about the days gone by can also make us happier. “Storytelling is really, really helpful,” she said, advising everyone to talk about the good times. “I’m pleased to know that I can be an inspiration to so many,” she added after finding out that herFacebook page has attracted more than 5,000 followers.